H. Rider Haggard, which imagines Odysseus's last voyage; and penning the "shilling shocker" The Mark of Cain (1886), which features, according to The Westminster Review, "one out-and-out villain, who had himself elaborately tattooed for felonious purposes" (590). For some of Lang's critical essays, see his Adventures among Books (1905) and Letters to Dead Authors (1886); another interesting work is The Valet's Tragedy (1903), where Lang discusses historical mysteries such as the Man in the Iron Mask. 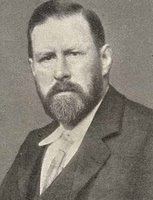 An overview of his work is provided in "Two Scotsmen of Letters" by Brander Matthews in Aspects of Fiction and Other Ventures in Criticism (1902). The legendary Triple Crown champion Secretariat, the winner of the 1973 Belmont by 31 lengths, was born today in 1970 in Virginia and lived to be 19 years old. One of his many descendants is Kentucky Derby winner Smarty Jones. To see the performances of "Big Red" in the Preakness and the Belmont, go here and here. Julia Jones's The Adventures of Margery Allingham has been reissued with new information (who knew that Allingham's husband Philip Youngman Carter had a child with another woman?). Here is a brief review from the Independent. Jones had an article in the Clues theme issue on Allingham (23.1, fall 2004): "'A fine, sturdy piece of work...': Margery Allingham's Book Reviews for Time & Tide 1938–1944." Recently on CBC Radio's The Next Chapter, Cuban expatriate Jose Latour talked about his thriller Crime of Fashion, Gail Bowen discussed her new novel The Brutal Heart, and Peter Robinson addressed questions such as "What's your greatest fear? ", "Who is your favorite hero of fiction?," and "Who are your favorite writers?" (It looks like the March 21st program with Agatha winner Louise Penny won't be available until March 28th). World War I-era dust jackets. Over on Alan Hewer's very cool Web site of dust jackets from the World War I era, some items of interest are John Buchan's Mr. Standfast (1919); Marie Belloc Lowndes's spy tale Out of the War (1918); and a whole page devoted to Sapper, including some Bulldog Drummond covers. Allen Lane and the founding of Penguin. An absorbing book has proved to be Penguin Special (2005), by Jeremy Lewis, about Allen Lane and the evolution of Penguin Books. Lane, a distant cousin of The Bodley Head cofounder John Lane, went to work at The Bodley Head at age sixteen, eventually running the firm after the elder Lane's death. The firm went into receivership after Allen Lane founded Penguin. It's hard to grasp, in this age of $1 Dover Thrift editions and ebooks, that Lane's idea for inexpensive paperbacks for the masses would be so controversial, but his fellow publishers, such as Jonathan Cape and Stanley Unwin, were convinced that Lane would go down in flames. Lewis well captures Lane's maverick, somewhat enigmatic personality, both in terms of his choices about what to publish and his refusal to back causes that more activist colleagues advocated, although he stood firm when prosecuted for publishing the unexpurgated Lady Chatterley's Lover. Bonuses in the book are portraits of the colorful publishers of the time (such as the leftist Victor Gollancz and the "lunatic" Walter Hutchinson) and early supporters (such as George Bernard Shaw). Penguin's first warehouse was a church crypt, and church services were known to be interrupted by swearing in the fulfillment department below. Lane became a lifelong friend of Agatha Christie (who began her publishing career with The Bodley Head), despite the firm's notoriously dilatory payment of royalties. Penguin sent books to British prisoners of war during World War II. Authors published under this program included Margery Allingham, Ngaio Marsh, and L. A. G. Strong (POWs complained when Penguin sent Pelicans, which were titles in its nonfiction line. They wanted adventure and crime novels). A key player in the launching of Puffin, the children's book imprint of Penguin, was Noel Carrington, the younger brother of painter Dora Carrington. Early managers of Penguin's U.S. operations went on to distinguished publishing careers: Ian Ballantine (founder of his eponymous firm), and Kurt Enoch and Victor Weybright (founders of NAL/Signet). Over on the Australian Broadcasting Corporation's First Tuesday Book Club is a request for nominations for the most powerful or moving fictional characters, which is slated as the subject of a future program. In considering such characters from mystery fiction, one on my list would be the serial killer Dix Steele from Dorothy B. Hughes's In a Lonely Place (1947). Hughes does a tremendous job in showing the reader how this character became what he was. You may find him chilling, but you do understand him. Are there other nominations from the floor? In addition, the First Tuesday Book Club has an archived list of recommended reads in crime fiction—not a lot of surprises, methinks, with the possible exception of American Horace McCoy, who is best known for They Shoot Horses, Don't They? (1935), but also was a hardboiled writer of considerable skill. John Masters this week on BBC Radio 7. John Masters's 1952 novel The Deceivers, about murder amid the Thuggees under British colonial rule in nineteenth-century India, is featured this week on BBC Radio 7. It was adapted as a film in 1988, directed by Nicholas Meyer and featuring Pierce Brosnan. Go here for the schedule or to listen. The Library of Congress has posted Stevie Wonder's 55-minute performance at the LOC on February 23rd. Highlights include "Overjoyed" and "My Cherie Amour." For the Webcast, go here.
. . . I had wandered into a world of cross questions and crooked answers. My latest selection in Patti Abbott's Forgotten Books series is Philip Bennion's Death by Richard Marsh, originally published as The Mystery of Philip Bennion's Death in 1897. Old Mr. Otway and his lifelong friend Philip Bennion sit up talking late one night about the art of murder, and Otway wakes the next morning to find Bennion dead. As a sleepwalker, Otway fears that he has killed his friend while unconscious (he also possesses a talent that many writers would envy: he notes, "I have written stories and dispatched them to editors while fast asleep, and they have been accepted and paid for" ). However, there is a packet of other suspects: the resentful servant; the wastrel nephew who inherits Bennion's estate; the beautiful ward whose engagement was opposed by Bennion and who was accused by Bennion of duplicity; and the fiance, who, with his financial success and hearty personality, appears to be the perfect catch, making Bennion's opposition baffling. A mysterious Italian cabinet bought for a song is presented as integral to the murder but Marsh skillfully walks the line between otherworldly premises and all too human motivations. Richard Marsh (aka Richard Bernard Heldmann, 1857—1915) is best known for the supernatural novel The Beetle (1897), which rivaled another novel—Dracula—that year in popularity. His grandson was the horror writer Robert Aickman. In addition to Philip Bennion's Death, Valancourt Books has reprinted Marsh's Curios: Some Strange Adventures of Two Bachelors (1898) and The Datchet Diamonds (1898), as well as his collection of ghost stories, The Seen and the Unseen (1900). Happy birthday, Sir Richard Francis Burton. The writer, translator, and explorer Sir Richard Francis Burton—seeker of the source of the Nile (dramatized in The Mountains of the Moon with Patrick Bergin as Burton and Iain Glen as John Hanning Speke) and the first Englishman to visit Mecca—was born today in Hertfordshire in 1821. More on his life and work can be found in Dane Kennedy's The Highly Civilized Man: Richard Burton and the Victorian World. As part of his always entertaining Cliff Janeway series, John Dunning posed an intriguing premise for Burton's trip to the United States in 1860; see The Bookman's Promise (2004). As an experiment, Oxford University Press is posting podcasts from its Dictionary of National Biography. Some biographies featured: Dr. Crippen, Ian Fleming, Jimi Hendrix, publishers Mills and Boon, and Piltdown Man. Slainté ("good health," to those who don't speak Gaelic; despite my incredibly British surname, I had maternal Irish grandparents), and Happy St. Patrick's Day. Valancourt Books has reprinted The Mystery of the Sea (1902), a neglected novel of Dublin-born novelist Bram Stoker. The firm also plans to reissue Stoker's Scotland-set smuggler tale The Watter's Mou (1894), which was praised by Arthur Conan Doyle on its publication. Jacqueline Winspear on KALW's Book Talk. KALW Book Talk host Alan Farley interviewed Maisie Dobbs creator Jacqueline Winspear on March 15th. Go here for the page on it; here for the podcast (which appears to be updated on Mondays at 11 pm). Maisie Dobbs is now in some sixteen editions. Jackie and I received Agathas in the same year—she for best first novel, me for short story—both of us with World War I characters and nervous wrecks at the awards banquet. 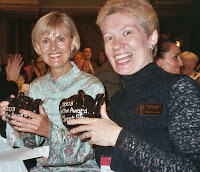 Here is a photo of us with our teapots (Jackie is the elegant one on the left). Ruth Rendell this week on BBC Radio 7. Short stories by Ruth Rendell are featured this week on BBC Radio 7, including "A Dark Blue Perfume," "The Wrong Category," and "Burning End." Go here for the schedule or to listen. The National Women's History Museum. The National Women's History Museum, which is aiming to obtain a permanent site on the Mall, features several online exhibits, including "Clandestine Women: Spies in American History." 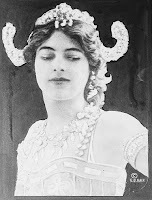 About the photo: Mata Hari. Library of Congress, Prints and Photographs Division. Thriller author and screenwriter Ridley Pearson, who also has teamed up with Dave Barry for a series of prequels to Peter Pan, was born today in Glencove, New York, in 1953. I once attended a delightful Texas Book and Author Dinner where Pearson and Barry appeared in fetching pirate hats. Coming from Pearson, appropriately in August: Killer Summer. In addition, Pearson and Barry are members of the extremely loud band The Rock Bottom Remainders. Go here for Pearson's performance of "You Ain't Goin' Nowhere." Over on the blog You Don't Say is Baltimore Sun copyeditor John E. McIntyre's attempt to combine proper grammar with hardboiled patter: "Down those mean sentences I walk alone." Police proceduralist Barbara Elizabeth Linington, aka Dell Shannon, Lesley Egan, and Anne Blaisdell, was born today in Illinois in 1921. Creator of the LAPD's Luis Mendoza, she was an Edgar nominee for Case Pending (1960) and Knave of Hearts (1962), as well as a historical novelist, ultimately producing about 80 books. She died in 1988. The multifaceted Peter Berresford Ellis, better known in the mystery world as Peter Tremayne, was born today in Coventry in 1943. His extensive background in Celtic history is reflected in his series of mysteries set in seventh-century Ireland featuring Sister Fidelma. Among his many nonfiction books is A Voice from the Infinite: The Life of Sir Henry Rider Haggard, 1856–1925 (1978). Winifred Holtby this week on BBC Radio 7. South Riding—the major novel by the pride of Hull, Winifred Holtby, and once filmed with Ralph Richardson—is featured this week on BBC Radio 7; go here for the schedule. The talented journalist and feminist Holtby, whose life was cut short by Bright's Disease in 1935, is the subject of a biography, Testament of Friendship, by her great friend, Vera Brittain. Reginald Hill this week on BBC Radio 7. Reginald Hill's Dalziel and Pascoe appear this week in Bones and Silence on BBC Radio 7. Go here for the schedule or to listen. Over on Radio New Zealand is a recent interview with former DI Jackie Malton, the inpiration for Lynda La Plante's Jane Tennison in Prime Suspect. Today's selection for Patti Abbott's Forgotten Books series is Zelda Popkin's lively Death Wears a White Gardenia, in which department store detective Mary Carner hunts for the murderer of the store's credit manager, who has been quite busy with an extramarital affair and various blackmailing activities. 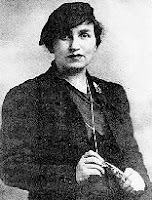 The pretty Mary, who was hired because "she looked like a lady, rather than like a detective" and for her "clear and quick" mind (25, 26), ably navigates her way among pretentious store executives, impertinent elevator operators, put-upon female secretaries, stalwart policemen and store security personnel, shoplifters from all walks of life, salt-of-the-earth cleaning staff, and—best of all—a prototype of that unique character, the New York cabdriver. Intriguing chapter titles include "The Inspector Finds a Clue," "Who Is Lying?," and "The Blonde in the Case." This is one in the delightful Dell mapback series. Journalist, author, and PR professional Zelda Popkin (1898–1983) wrote one standalone, So Much Blood (1944), and four mysteries with Mary Carner after Death Wears a White Gardenia: Time Off for Murder (1940), Murder in the Mist (1940), Dead Man's Gift (1941), and No Crime for a Lady (1942). Popkin's A Death of Innocence (1971) was adapted as a CBS TV movie in 1971 and starred Shelley Winters as the mother of a murder suspect. Her best-known books are probably The Journey Home (1945), about a serviceman returning from World War II, and Small Victory (1947), one of the earliest U.S. novels dealing with the Holocaust. For further details, see this Web site on her work developed by her grandson, University of Kentucky professor Jeremy Popkin, and her autobiography, Open Every Door (1956). Author and travel writer Constance Fenimore Woolson, great-niece of James Fenimore Cooper and friend of Henry James, was born today in New Hampshire in 1840. She died in 1894, when, suffering from an illness, she either fell or jumped from the third floor of her Venice home. She was a pioneer in discussing issues such as spousal abuse and race relations in her work, despite her publisher's attempts to stifle her on the latter subject. Her novel Anne (1882) has a detection element, in that the title character investigates a charge of murder against the man she loves. The Smithsonian magazine features an article on the ability of forensic anthropology to solve centuries-old cases, featuring Smithsonian anthropologist Doug Owsley and tying in with a Smithsonian exhibit on view until February 2011. Conan Doyle continues to do nicely at auction. The debut of the Amateur Cracksman. George Simmers on the Great War blog looks at the 1898 debut of A. J. Raffles, cricket player, gentleman burglar, and—according to Anthony Hope, author of The Prisoner of Zenda—a "low scoundrel" (qtd. by Richard Lancelyn Green in Raffles: The Amateur Cracksman, p. xlii). Raffles was created by E. W. Hornung (1866–1921), the brother-in-law of Arthur Conan Doyle. I was always very fond of Bunny Manders, Raffles's put-upon sidekick, and liked not only the Hornung stories but also the versions by Barry Perowne (aka Philip Atkey). A list of Raffles-Holmes meetings outside of the Hornung-Conan Doyle oeuvre can be found here, including "The Problem of the Sore Bridge—among Others" by the recently departed Philip Jose Farmer. As March is Women's History month, this month I plan to mention online resources pertaining to women's history and highlight women writers' contributions. Today's is the splendid UCLA Web site Wilder Shores: Lady Travelers of the 18th and 19th Centuries, featuring such individuals as Isabella Bird Bishop, Amelia B. Edwards (an inspiration for Elizabeth Peters's Amelia Peabody Emerson), Mary Kingsley, Lady Hester Stanhope (who appears under another name in Mary Stewart's The Gabriel Hounds), and Frances Trollope (mother of Anthony). Happy birthday, Constance Fenimore Woolson.